These rugged outdoors style Camo Sheets combined hunting camo and blaze orange. Made of 100% polyester. These sheet sets will be the perfect compliment to your camo bedding ensemble. 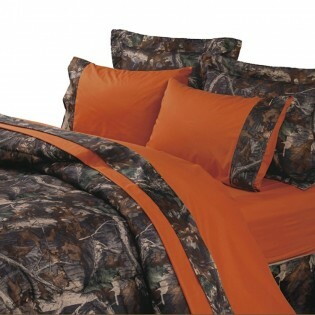 These rugged outdoors style Camo Sheets combined hunting camo and blaze orange. Made of 100% polyester. These sheet sets will be the perfect compliment to your camo bedding ensemble. Fitted sheets are designed with deep pockets to accommodate mattress up to 18" deep. Each set includes one flat sheet, one fitted sheet and two pillow cases (1 with twin). Ships in approx. 1-3 business days.